I love teaching my students about different kinds of poetry. If you want to do the same, you might like this freebie. 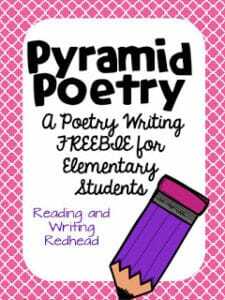 With it, students will learn about pyramid poems, read a sample, and then try to write their own. It was created for grades 2-5. Below is a sneak peek and if you want to grab the free download, click here or on any image below! Enjoy! If you would like to take a moment and give feedback after you download it, I would appreciate it! Thank you!